Gr 8 Up –Ursa is among the first colonists to arrive on Beta Earth, a planet that is being bioengineered for human life. BLAIR, Kate. Tangled Planet. 260p. Dancing Cat Bks. May 2018. pap. $14.95. ISBN 9781770865044. Gr 8 Up –Ursa is among the first colonists to arrive on Beta Earth, a planet that is being bioengineered for human life. As plans are followed to prepare Beta for inhabitation, settlers spend their time between the land and the spaceship, the Venture. When Ursa finds her brother-in-law dead in the forest after a community bonfire, fear and uncertainty about the new planet grip the colonists. Despite her claims of having seen an unidentified beast in the forest moments before finding the body, she is accused of murder. The colonists become divided; some feel it best to risk the unknown dangers of the planet, while others, including Ursa, wish to remain safely on the Venture until all possible dangers are identified. Meanwhile, the mysterious predator claims more and more victims. 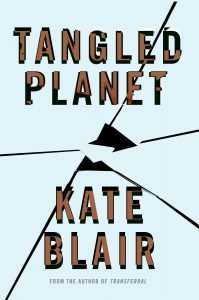 Blair’s world-building is exceptional, immersing readers in the juxtaposition of the exciting unknowns of Beta and the comforting protocols and societal structure on the Venture. Ursa is a fully developed, likable yet flawed character who will push teens to consider if comfort is a worthy sacrifice for the potential greatness of the unknown. A robust cast of secondary characters, each layered with their own motivations, histories, and perspectives, round out the novel and propel its fierce pace. VERDICT A must-have for every library. This sci-fi mystery will be devoured by fans of Beth Revis’s Across the Universe and Veronica Roth’s “Divergent” series.–Amy McInerney, Falmouth Elementary School, ME This review was published in the School Library Journal January 2018 issue.